The first two “Squirreling Gone Wild” stories were examples of extreme ways to pinch pennies, both by an old college buddy of mine from 20 years ago, with whom I am still friends. This third story in what is shaping up to be a periodic series, is yet another example that involves – you guessed it, the old college buddy! This one, on the other hand, is a bit different. A bit more opportunistic, and again, not for everyone. Nevertheless, some good can come from it in our modern day application of these approaches. So, what else did he do, besides the gas station penny scheme and food couponing I illustrated in the first two “Extreme” posts? Well, he looked for money in strange places. Mostly, it was for effect and shock value, as he knew that it would get a laugh out of us or push some people’s buttons. But he did, on occasion, try to search for coins in offbeat places. 1) Under the Drive through window. Yes, he really did this. I was with him only once when he did this, but I know he did this other times. Anyway, he had previously worked at a major fast food chain while in high school, so he came to find out about the idea that loose change can be found under the drive through window. Apparently, enough people would drop a coin or two here and there that there was often a decent collection of change by late in the day. He claimed he could pay for his meal with what he found by the window, and I recall him coming close on that occasion. 2) In vending machine coin returns. He would quickly reach down and check them periodically, sometimes finding a quarter here and there. As a corollary to this, he would look at vending machines to find instances where a bag of chips or candy bar was hanging down, having not fallen down when someone before him had put money in. He would then put money in to buy one, and get two for the price of one, as he got the one hanging plus the one behind it which he paid for. 3) In parking lots. For this one, I actually just remember one instance, where he found a $10 bill laying in the lot. He grabbed, held it up, and said “YES!” with the look of someone who found treasure. Pure satisfaction for him, I still remember his reaction. 4) At a movie theater concession stand or fast food restaurant, on the floor by the counter. He probably found some pennies or other loose change here and there. 5) In front of parking meters. Yes, sometimes people drop coins by the curb and don’t pick them up. He told me about this, but I never saw him do it. Juvenile? Yes, I certainly think so. What adult wouldn’t think so? I’m not even sure if its ok to take loose change like that from private property – I wouldn’t do so. Regardless, it was all part of this guy’s shtick, and I theorize that it was partially a way for him to draw attention to himself and partially an aspect of him truly being frugal. Besides being a story of extreme penny pinching (or something of the like), its also a lesson on how money can show up in the most unusual places, often there for the taking like low-hanging fruit, so to speak. As adults, here is something we can do with money we happen to find (not his way!) or obtain as a total surprise or through luck: GIVE IT AWAY. Yes, give it away. Whenever we come across something unexpected – whether its finding a $1 bill in a public park, or winning something in a free-entry contest – why not give it away? Accumulate it through the year, then at the end of the year, give it to a charity or organization that will make sure that a needy person or family will benefit. Keep loose change/bills found like this in a charity jar, other items in a special container, and then donate toward the end of the year. Do you like to practice continual self-improvement? Do you like to expand your mind, learning about different topics? Do you like to read for entertainment? Do you subscribe to magazines or other periodicals? Do you like to rent movies or CDs? Do you like to save money? If the answer yes to any of the above (I know the part about saving money is a given! ), then you may want to take another look at your local public library. Depending on where you live, your library might surprise you with what it has to offer. I do realize that some communities have mediocre libraries, or might even be in locations where the nearest library is quite a drive away. In such cases, a public library might not be the best use of one’s time. In other locations, where the facilities are decently funded, your library might be worth your while. In fact, it could be much better than you think. Last year I paid a visit to my local library, which is in a solid, middle class suburban location. I recently moved to this community, and had heard good things about the library, so I thought I would check it out. My expectations were really modest – I thought I would see current periodicals, but mostly dated books and audio-visual material. Basically, I thought the library might be a place where I could go to get some things done, as an alternative to a coffee house. I like to periodically go to a coffee house to get some things done in a relaxed work environment. Anyway, I did find it to be a quiet environment, with WiFi and comfortable surroundings. Much better than libraries I remember from being a kid, or from back in undergad days or from graduate school. But what really surprised me was the high quality of the materials the library had to offer. They did have current periodicals as I expected, but had a much larger variety that I would have thought. And the books….well, that was the big surprise. Instead of a selection of dated books with only a few newer releases, the library had a selection of dated books which was also accompanied by a surprising inventory of newer releases. The newer releases cut across topics, and the depth of the offering was very impressive. What really impressed me was that most of the top best sellers, fiction and nonfiction, were stocked and available. If not, the wait wasn’t long at all. Best yet – you could have up to 50 items checked out at one time! Not that I have the time to read that much, but its good to have the flexibility to have 5 or 6 good books with you. For those of you who regularly patronize your local library, this might not be news. But for myself and I am sure many others, it is good to remember that your local bookstores aren’t the only places to get some of the new releases you want to read. From a financial point of view, as a squirreler, it can save you a significant amount of money. For example – if you buy a book per month at a bookstore, either in person or online, you might be looking at $20 per month or $240 annually. You might be able to get half of those books at your library, and save $120 per year. Remember, you can usually renew books, so if you can’t read it all in a few weeks, you can often get additional weeks so that ultimately you have 6 weeks or more to read a given book. Additionally, as I mentioned, you can frequently check out a large number of books at one time, so this provides more opportunities as well. Its a great deal – read, learn, and save money. And if you read on personal finance or career growth, you can save money while learning to save or make more money. So your savings can be compounded! Its worth checking out, especially since your hard earned tax dollars are already paying for these books. Technically that’s a sunk cost so it shouldn’t influence your decision to use the library from that perspective, but its something to think about! My initial “Squirreling Gone Wild” post was regarding my college buddy from way back when, who would routinely fill up his gas tank at one penny over a whole dollar amount, and then take a penny from the jar at the counter. As I mentioned – can’t recommend that to adults, but I got a kick out of it 🙂 Additionally, while a bit nuts (pun intended), its an example of extreme squirreling. After going through that story, another example came to mind, so I thought I would add a second “Squirreling Gone Wild” post. This second example involves the same college friend. This guy, after college (early 90’s), would try to save money in most situations, though not all. For example, he bought an expensive car right out of school, with a sticker price equal to 60% of his starting salary. He later learned his lesson, and within a few years had made it a practice to buy only used cars for which he paid cash and got great deals. Anyway, back to this second example of extreme squirreling. During this post-college stage, one of the areas where he did try to pinch pennies was with food. Now, he might go out with a group once in a while and have no problem spending on a fun evening out. All was normal there. That said, on other days, he would try to eat at home (smart) and get deals outside where possible (clever, though not always wise). His eating at home deals took the form of coupons on top of sales at the supermarket. As a post-college student, he would save good coupons and wait for deals on frozen entrees. For example, there might be a deal for a Lean Cuisine-type of entree at 2 for $3. He would bring in a coupon for say, $0.75 off an entree. Then, the supermarket would double those coupons. He would net out at ZERO spent on a meal. He relished those “arbitrage opportunities”, as he called them. For eating out, he would go to a happy hour and eat the “complimentary” buffet. He scoured the area to find two that offered food with the purchase of at least one drink. This was usually one day of the week, in the early evening for 2 or 3 hours. He would skip lunch on that day or maybe just eat an apple or something small (not smart, but he did it), and then just load up at the buffet. He would buy the compulsory drink for $1, and then fill up with mini burgers, pasta, nachos, etc. His other favorite was going to a bagel place to get a bagel and cream cheese for lunch. Again, not the most nutritious lunch, but he used buy one get one free coupons, and had the other one at dinner or lunch the next day. Bagels that are a day old are not too great in my opinion, and he would complain that they were chewy. But as frugal as he was, the thrill of saving would apparently override that issue:) To make the deal better, he would use their loyalty punchcard of buying 6 and getting the 7th free. They punched the card even for the second ones of the buy-one-get-one, so he could go there 3 times and get 7 bagels w/cream cheese. At about $1 per bagel, he would get 7 meals for $3. All told, that’s 11 lunches/dinners for him through the week, and remember that he would skip lunches on the happy hour days and essentially eat a piece of fruit or another small snack. 6.5 days of lunches/dinners for the price of a little more than $5. The good life…..a beautiful home in a tony neighborhood. Private schools. A high end luxury car or high performance car – maybe both. Cool vacations. Frequent nights out for expensive dinners or entertainment. Shopping for nice clothes, the newest gadgets. All the best for today, and tomorrow is another day. All of this is what many people have seemingly aspired to – or have gotten caught up in. Whether it’s the desire for nice things just for the sake of having them, or it’s the drive to keep up with the Joneses and maintain an image, many Americans have been working for this type of life. Many people still keep this approach. I’m willing to guess that even if these tendencies have been muted lately in a lot of people, they are still there and are just dormant for now but will re-emerge. However, for others, the recent economic conditions in this country– namely the manifestation in job losses, home value declines, and the topsy-turvy stock market – have caused a shift in perspectives when it comes to money and its role in our happiness. It may be a smaller segment of the population, but for some, being frugal is now cool. I can relate, because I’m one of those, to a certain extent. Now, I have always had some focus on saving and investing, but have aspired to some of those nicer things to a certain degree. I still want certain things, and do set long-term goals that I am working toward when it comes to those things. Goals are great, and its fun and exhilarating to work toward them. But higher on my list is living within my means and saving for retirement, medical issues, unexpected financial emergencies, and overall financial peace of mind. Why? Because these economic times have left the impression on myself and many others that ups and downs in the economy WILL happen, and to large extent, most of us WILL be impact to some degree. Some of us be impacted a little bit, some of us will be impacted tremendously. These ups and downs have caused people to take another look at what is truly necessary in day to day life, and how limited financial resources should be allocated. Is it worth living in an expensive house with big mortgage payments and tax liability, that don’t go down even if the value of the house goes down? Is the house truly an asset as many of us have been raised to think, or can it be a huge liability as many going through foreclosure have come to find out? Is it worth driving an expensive car with monthly payments? Or is it worth spending far less, perhaps paying cash up front, and saving the extra money? Ultimately, what many people have found out is that the income streams that most people use to feed their families are not guaranteed. If a job is lost, there might not be a replacement job to be found in short order…it may take a long time, and the replacement job may not pay a salary comparable to what was made before. That’s if a replacement can even be found in the same industry or line of work. With limited or uncertain income, what should we focus on first? Many people are realizing that its best to focus on necessary daily expenses while preparing for future cash flow needs that could result from loss of job or the medical or unexpected financial emergencies I mentioned before. The stress of meeting needs today has jolted people into thinking about the rest of their lives. Is it worth it to have all of the finest things today, while worrying about tomorrow some other time? Or, is it better to live with the necessities today, and forego the finer things for additional savings instead? What’s the tradeoff? It’s the mental dissonance of living with less than you technically could purchase now, knowing you could buy more – in exchange for the peace of mind that you have by knowing that you are taking pressure off yourself in future years. In its simplest form, it could be seen as delayed gratification. But looking at it further, its risk management because today you have income, but you really don’t know what could happen in the future. You might not have income, or you might have it but have massive cash outflow. Smartly, many people are in a way “self-insuring” themselves by living on less today so that they preserve the possibility of at least living on something in the future. Given that positive cash flow appears less certain now, in the minds of many, the value of that peace of mind that comes with saving has increased. Yes, the value of savings not just in monetary terms but in peace of mind has increased. In the overall scheme of things, savings are more important now than before to many people. Pulling these thoughts together, what it comes down to is that the fear of financial problems has changed the value equation for what we invest our money in. Instead of buying all the luxuries in life with our current income, many of us are valuing peace of mind and financial FREEDOM more. And it redefines what it means to be “rich” – not just having money to buy the best things or luxuries, but enough money to reduce pressure on our minds and bodies. It’s cool to have freedom, and live responsibly and be out of financial misery. It’s not as cool to talk about how you bought a big house 3 years ago with big payments, one which has declined in value substantially since then and your hard-earned equity has been wiped out. Ah, the good life……a good enough home in a safe neighborhood with quality public schools. A practical, fuel-efficient, safe car. Inexpensive family getaways. Inexpensive, meaningful family activities for entertainment. Shopping for good, reasonably priced clothes on sale, and the technology we truly need. At least we have the basics for today, and the basics for tomorrow. And if we’re smart, maybe tomorrow will offer those finer things. That peace of mind makes us truly rich. I was thinking about past instances of frugality, and I came up up with one example that I found particularly interesting that would be fun to share. It’s an example of extreme “squirreling”, going to micromanaging levels of saving, good in spirit but executed in a way that it’s hard to recommend to any adult. That said, it does reflect a true commitment to actively looking for opportunities to live within one’s means in a creative way, which as I said has something of value to take away. My example is actually about a friend’s behavior. And yes, it was really a friend, and not me🙂 This friend, with whom I am still acquainted, had some very frugal habits back in college about 20 years ago. I could go on and on about the interesting things this guy did. One that I will share now regarded how he purchased gas at the station. He would always pay in cash, but would always make sure that he stopped the pump when he was $0.01 over a whole dollar amount. For example, instead of stopping at $10.00, he would stop at $10.01. Then, he would pay $10.00 in cash and take a penny out of the little dish at the register – you know, the one where you take one if you happen to be short. Well, he planned to be short. He would stop for gas twice a week, partially fill up, and rotate gas stations so they wouldn’t catch on. The stations were close to each other and on his normal drive, so it didn’t take him out of his way to do this. His thought was that if he filled up 2 times per week, over the course of the year it would give him $1.04 in free gas. At that time, way back when, that would actually buy you a gallon. So, his thought was that for very little effort he could get a free gallon of gas over the course of the year. As a grown adult, I can’t imagine doing that. Self-respect is infinitely more important to me. Does that cross the line from being frugal to being bit crazy? Maybe! I would say its nuts, but that would not be such a bad thing, as us squirrelers have to be a bit nuts :)! Interestingly, this guy has done very well for himself since then – financially and otherwise. This post was featured in the 224th Festival of Frugality at Frugal Upstate. Let’s Get Philosophical: What Role Does Money Play in Our Lives? When it comes to our finances, each of us has our own individual approach. Some of us are savers, some are spenders, and others are somewhere in between. This continuum is a paradigm that our popular culture uses to frame differences in the way people approach money. I believe that the way we approach our finances goes beyond that particular behavioral characterstic. In reality, I think our approach to finances can be viewed in more of a multi-dimensional setting, where money has a different role in each our lives. For some, money means survival, plain and simple. For others, money is something that is a part of their lives but rarely on their mind, regarless of the role it actually plays. For yet others, money is an obsession, as accumulation signifies achievment. Some people view money as analogous to insurance, or a defensive resource to protect against future setbacks. Some people want money to provide a good home….or to contribute to the ability to have certain hobbies….or to provide something to bequeath to future generations….and so on. Sometimes the same person may view money differently in different situations. The bottom line is that we each have our own relationship with money, and our own conscious and subconscious needs for money, rooted in our value systems and cumulative life experiences. This is an area of personal finance that has interested me for a while. Why do people behave the way they do with respect to their money? What’s driving this behavior? Of course, a starting point for anybody is to consider how you personally view things. Taking an introspective approach, I have spent time figuring out my own take on money, and the role it plays in my life. 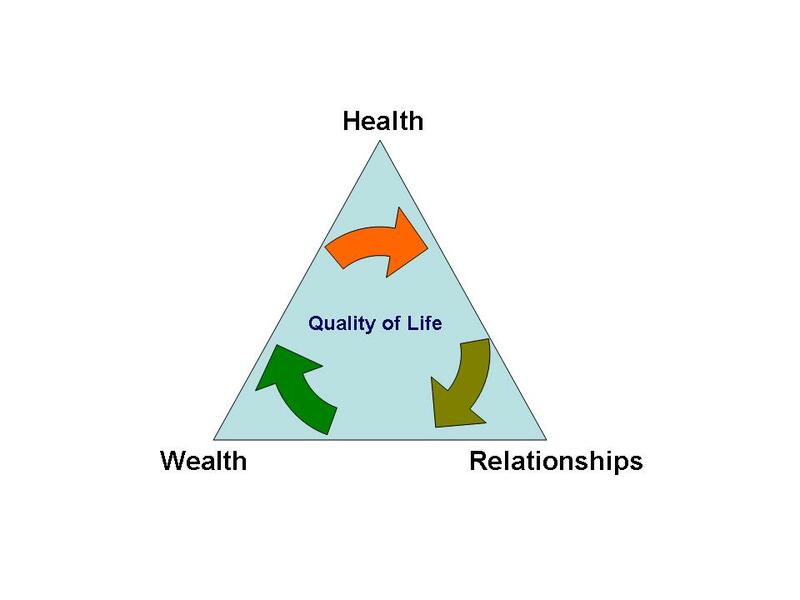 What I have determined is that it fits into the framework of HWR – Health, Wealth, and Relationships. These are 3 key parts of life, linked together as a part of a system. Think about it: HWR – Health, Wealth, Relationships. They’re all connected, and to the extent one is strengthened, the others will be strengthened as well. If one is weakened, the others will be weakened as well. For example, lets take 2 people: A and B. They are twins. A has good health, average wealth, and good relationships. B has good health, average wealth, and poor relationships. Over time, all other things being equal, I think that A will end up having a better overall quality of life. My reasoning is that A’s good relationships will be good for his happiness and will lower his stress levels compared to B, which will give A a chance to be healhier. As A is healthier, he will have a better chance to be wealthier, as he will be able to in better position to earn money while having lower healthcare expenses. And while he is healthier, he in turn will be in a better position to cultivate, keep, and grow relationships, leading to better chances to be wealthy, etc. Circular, perhaps…yet very symbiotic. So to me, money is a part of the Wealth aspect of HWR. Beyond basic survival, money gives you the opportunity to live a healthier life, with the time and means to have more positive relationships. One thing I want to make clear is that I am not saying that money buys friends. Well, it could, but those aren’t true friends. What I am saying is that the more money you have, on balance, the less stressed you are about it, and the more time you have to do other things, such as cultivate true, genuine relationships that aren’t based on money. Money is but a component in the system. There is no right or wrong framework, each of us has our own specific one, whether we have consciously thought about it or not. It would be interesting to get the perspectives of a range of folks to see the different views of money in all of our lives. Here it is in a nutshell: I want to be safe and secure financially. It would also be great to have some luxuries in life. And it would be great to feel financially comfortable to the point of being able to contribute to people and causes that are dear to me. All of this sounds great. Is it even possible to do? I suppose it depends on where you are in life, in terms of age, current financial situation, education, career, health, etc. Some of us end up pretty well with this equation, others not as much. Where am I? Well, I’m 39 with 2 kids – both young. And I have some accumulated savings, but not nearly enough to feel anywhere near secure, let alone live in luxury or be as giving as I would like to be. I have had a career with a Fortune 500 company, and have earned an MBA from a top business school. Then, in 2009, my position was eliminated. This has given me some perspective on things. I used the situation as an opportunity to to reevaluate my goals and my approach to personal finance and its role in my life. I am energized and excited about it! I have, for much of my adult life, been focused on being conservative with spending and savings but not as focused as I could have been. Don’t get me wrong, I have always cared about personal finance. But I always assumed that job promotions would occur periodically (thus meaning jobs kept), cash flow would always be coming in, and my savings would be accumulating and growing in value. And I didn’t assume any financial calamities. 1) You have to expect the unexpected. It will happen, but you might not know what form it will take. It could be good, but many of these unexpected events are challenges that cause us to alter or reconsider our plans, as they make things more difficult than they would be in their absence. Job Loss, Divorce, Medical Conditions…these are the types of things that I’m talking about. Most of us will have something in this category happen in our lives, and it will be a challenge…..and will be something that will be unnerving because it didn’t fit into our vision of things. 2) If you want something to happen, you have to make it happen. YOU have to MAKE IT HAPPEN. I repeated that because its a key insight. If I want something, I need to make it happen…it won’t happen out of the blue for me. You just can’t rely on surprise good luck, and you can’t just say, “someday I will do X, and someday I will get around to doing Y, etc.” You have to make it happen without procrastination. If you know what you want, there is no better time to get working on it than now, because life moves fast! Anyway, these are my key insights that have come to me as I am taking stock of where I am financially and how that fits into what I want out of the rest of my life. I know what I want – I talked about it above – but have not been focused up to this point. I now realize that unexpected things happen – they should be expected, in a way. And, I realize that I need to take stock of what I want, and go after it. OK – I’m talking a lot about what I want. ME. Fair enough…what about YOU. Well, what is it that YOU want? If you are interested in just some or even all what has been described here: security, aspiration, and benevolence with your finances – then I welcome you to join me in the quest to meeting our goals. Basically, the idea is to get us to be knowlegable – both intellectually and in a street smart way – to the point of being able to confidently go after our financial and bigger life goals. Squirrelers is dedicated to helping you save, protect, and grow your hard-earned money. I know that you devote considerable time and energy to your efforts to make a living, and want you to be able to do more than work to pay bills to get by in day-to-day life. I want you to work toward financial PEACE OF MIND, where you don’t have to worry the basics for you and your family to survive. I want you to work toward financial ACHIEVEMENT, where you can have the means to enjoy some of the finer things in life. I want you to work toward financial BENEVOLENCE, if you choose, where you can comfortably give toward helping the causes and people that are dear to you. In short, I want help you “squirrel away”, or save your money, so you can protect and grow your nest egg – which will enable you to transform your finances from being a cause of stress to being a vehicle to help you achieve your life dreams. These are all goals of mine too, and I hope that we can all reach these goals while enjoying the journey and having fun with it!